Repeated use of the cards results in the students acquisition of knowledge with little or no memorization required. We used Winston Grammar along with other grammar methods. Its fun for everyone but especially useful for kids who need "hands-on" materials to keep them interested. Each student has colored cards with the names of each of the parts of speech printed on them. As the teacher calls out the sentence, the child puts the appropriate card in the order of the words in the sentence. Its easy for the teacher to spot when the student puts the card out if the answer is correct because each card is a different color. My kids loved this hands-on approach. There is a pre-test for placement if the student has had some exposure to grammar concepts. The Basic Program has 30 worksheets, four quizzes and a post-test. A Teachers Manual, Student Workbook, and a set of color-coded cards are packaged in a velcro-closed vinyl storagecase. 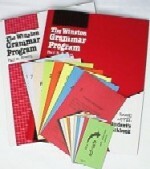 The Basic Student Package is a Student Workbook and a card set. It is ideal for each student to have their own workbook and card set, so a student package is needed for teaching more than one student at the same time. The Advanced Winston Grammar Program picks up where the Basic Program leaves off. After several worksheets of review, the topics covered are: possessive adjectives, possessive pronouns and nouns, reflexives, interrogative pronouns, present and past participles, correlative conjunctions, infinitives, gerunds, relative pronouns, compound and complex sentences, and embedded noun clauses. A Teachers Manual, Student Workbook, and a set of color-coded cards are packaged in a velcro-closed vinyl storage case. The Advanced Student Package is a Student Workbook and a card set. It is ideal for each student to have their own workbook and card set, so a student package is needed for teaching more than one student at the same time.